A secret place in the Spirit. A place of divine encounters with our heavenly Father where we express our love for Him and enter the dimensions of His glory and power. Where we welcome His presence, receive His revelation and guidance for our life, and are empowered to serve His purpose on earth while experiencing the outpouring of His grace through miracles, healings, deliverance, and salvations. With a scriptural foundation, the conviction of personal experience, and the evidence of many testimonies, Guillermo Maldonado passionately reveals how to enter this place in the Spirit so we, as the body of Christ, can become “a house of prayer.” Discover the joy of two-way communication with the Father. Learn not only to hear His voice but to listen and act on what He is saying to you. See how to build momentum in your prayer life, creating a spiritual atmosphere in which God moves powerfully on behalf of His people. 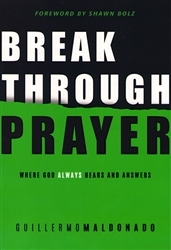 Discover essential keys for breakthrough – and how to have all your prayers answered according to God’s will and Word. If you think of prayer as a duty – think again! Apostle Maldonado reminds us that prayer is, first and foremost, a place in the Spirit where we are united with our heavenly Father and are empowered for His purposes. It is where we experience the glory of His presence to shatter strongholds and set captives free. 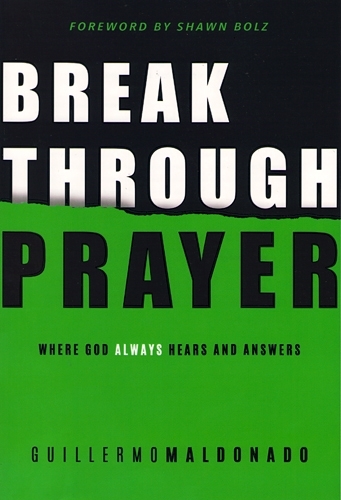 Learn to enter God’s presence through breakthrough prayer, creating a spiritual atmosphere in which He moves mightily to heal, deliver, and transform lives. I love Pastor Guillermo’s teachings on prayer because I have personally witnessed him praying. Prayer opens doors to the supernatural, and I am eager to meditate on his book. Every believer needs this teaching in order to mature as a Christian. I have learned much from Pastor Guillermo and his wife, Ana, on this vital topic, and I am expecting more breakthroughs on prayer. Active in ministry for over twenty years, Guillermo Maldonado is the founder of King Jesus International Ministry – one of the fastest-growing multicultural churches in the United States – which is recognized for its visible manifestations of God’s supernatural power. He is a spiritual father to a growing network of over 300 churches in 50 countries that comprise the New Wine Apostolic Network, which he founded. Apostle Maldonado has a doctorate in Christian counseling and a master’s degree in practical theology. He resides in Miami, Florida, with his wife and partner in ministry, Ana, and their two sons, Bryan and Ronald.